This class will learn about graphics typically used by early PA German craftsmen and apply them to a mini blanket chest. Christian Selzer worked in Dauphin County creating painted chests that today are highly prized by collectors. 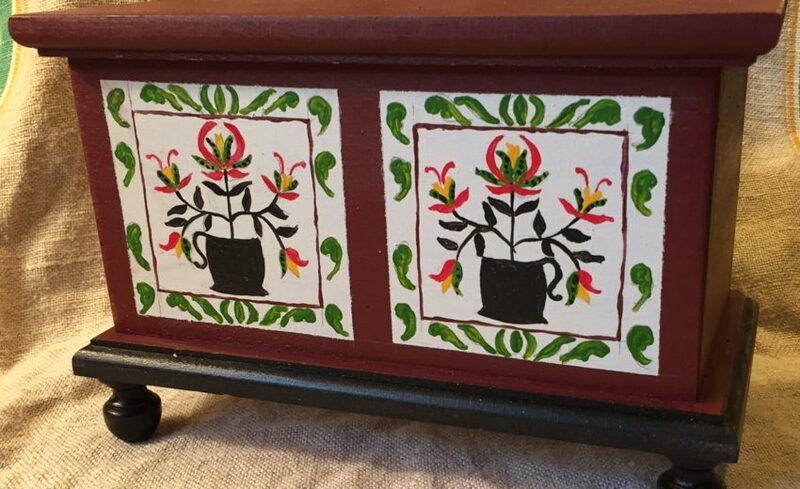 This class will paint tulips in a pot on each of two white panels in the manner of Selzer in the spirit of Dutch folk art exuberance. Bio: Jim King has a B.A. in art from Goshen College, Goshen, Ind. He began studying vinegar painting in the 1980s when he was inspired by grain painting antiques he was collecting. He purchased blanket chests in disrepair at auctions and flea markets and then restored them and applied vinegar painted surfaces. He had difficulty finding smaller chests and started having Old Order cabinetmakers copy his antiques which he then grain painted using a variety of traditional techniques. Students will receive a box to paint, paints to use in class but should purchase their own brushes to bring to class. Easily purchased at Michaels, we will need a Zen acrylic Level 2, 20/0 liner brush, Zen acrylic Level 2, 4 shader brush, Zen acrylic Level 2, 0 round brush, Exact-O knife and a soft lead pencil. Register online or download our registration form and return with payment. Register online or download our registration form and return with payment. Cancellation policy: All materials must be pre-purchased by the instructor, therefore cancellations can only be refunded prior to January 21 (sales-end date). Refunds requested before that time will be issued via paper check, less a $20 non-refundable processing fee. We reserve the right to cancel a class due to insufficient registration. In that case, students can me another choice or receive a full refund. A letter confirming your registration will be mailed or e-mailed. Hours: 1 p.m. – 4 p.m.